For everyone who secretly dreams of cooking up feasts in a country kitchen! Bestselling cookbook author Sally Wise has won countless fans for her no-nonsense recipes and delicious, nutritious food. Now she brings together the best of her farmhouse kitchen recipes in a beautiful, full colour cookbook. 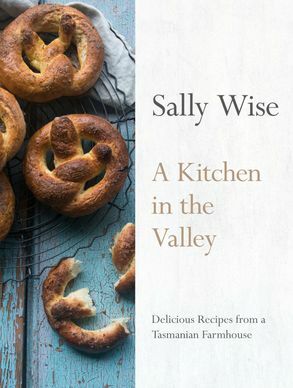 A KITCHEN IN THE VALLEY showcases more than 100 of Sally's recipes for breakfast, lunch, dinner, dessert and afternoon tea - all accompanied by glorious photographs of the food, produce and landscapes of Sally's native Tasmania, from the abundance of the Derwent Valley, a burgeoning new food region, to the bountiful sea. Sweet treats abound, including a rich Caribbean chocolate tart and pretzels with lavender, lime and a chocolate ganache dipping sauce, but there are also hearty dishes to feed family and friends and keep out the winter chill - such as venison pie or roast lamb with a redcurrant jus. Delicious, nutritious and making the most of the wonderful Tasmanian produce, Sally's recipes always work. In the photo essays between the recipes you'll meet Tina, the Smartest Pig in Tassie, who's partial to Sally's jam sandwiches, not to mention plenty of dogs, sheep and chooks, and you'll discover the local produce, markets and landscapes of the Derwent and other regions close to Sally's heart - like the Tasmanian coast, with all its amazing seafood.